HICKORY, N.C. -- Bob LaBarge of Hickory-based ZLOOP says the company entered short-track racing to reach the public. Next year, ZLOOP will sponsor the 10-race ZLOOP Challenge at Hickory Motor Speedway, and that should make the eWaste company more visible. “We've worked out a great relationship with (HMS promoter) Kevin Piercy,” said LaBarge, the company's chief marketing officer. “We think we've got to start at the racing roots, and Hickory is a great racing town. In a way, the Hickory ZLOOP franchise — there are many all over the country — got its start in racing. LaBarge, originally from New York City, says he met partner Bob Boston at Talladega Superspeedway in 2009. And they thought of racing to educate the public. Bob Boston is the company's chief operating officer, and Chris Knight is director of sports marketing for ZLOOP. “We've been dealing with racing for 3½ years, and we're quietly building ZLOOP,” said LaBarge. “We're trying to use motorsports to educate the public about eWaste. LaBarge says most folks locally pronounce it zee-loop, but the correct pronunciation is in one sound (sort of like the sound a viscous substance might make coming out of a can). ZLOOP is slowly getting into racing. It sponsors motorcycle drag racer L.E. 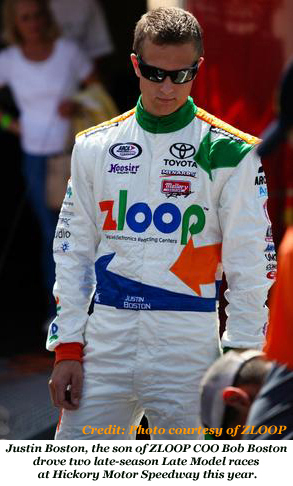 Longlet as well as the 2013 ARCA campaign of Bob Boston's son Justin. The company had a Night at the Races scheduled Sept. 9 at HMS, but it turned into Afternoon at the Races when rain forced the racing program to Sunday. Justin Boston ran 11th in ZLOOP's Afternoon at the Races and finished sixth in last Saturday's Fall Brawl at HMS. Next season, the ZLOOP Challenge won't add to the length of the Late Model season, and it'll be a points race within a points race. At least one Limited Late Model driver, 2012 track champion Shane Lee, plans to run the ZLOOP Challenge while also running Hickory Limited races in 2013. Lee said he'd get Late Model experience and a shot at larger purses. “(The Challenge) pays more money, and they're all 100-lap races,” he said. Austin McDaniel, the Late Model track champion, says he might try the ZLOOP Challenge. “I think we'll probably end up doing it and try a few other tracks,” he said. The Challenge money is the attraction. The Challenge's seasonal points fund pays the top five finishers at the end of the year: $3,000 for first, $1,500 for second, $1,000 for third, $750 for fourth and $500 for fifth. Each race purse will pay $2,000 for the winner (which should draw nice race fields), $800 for second, $600 for the third, $500 for fourth and $400 for fifth. Each spot will pay a little less, with finishers 15th and below getting $150 each. The first race of the challenge is tentatively set for March. The championship will be decided in September with a “gigantic celebration” and a fireworks show, Piercy said.